Laura loves the pandas. She is in grade 5. For her birthday she held a dinner, auction and raffle at which she provided an evening of entertainment in honor of the pandas. She raised $228! She featured an artist of the month and had a vocal student perform. It was quite spectacular event for an 11 year old to organize. She invited friends and neighbors. Thank you Laura for your amazing dedication to the Giant Pandas. Lili is nine years old and loves Pandas, and although she has yet to see one in real life her dream is to adopt one when she gets older. When she heard that she could be a Panda Protector and help raise money for them through Pandas International she jumped at the chance. She made cupcakes and brownies to sell at the local fireworks display and even though it was a warm day (around 34c - 94f) and around half of her inventory which she had stayed up making the night before melted in the heat she managed to sell out of her remaining stock. She hopes to continue to raise money for the pandas and is working on her next venture (using her gardening skills to raise money). She lives by her own manta "Pandas forever, extinction never" ​​​​​​​​​​ Thank you Lili for your dedication to the Giant Pandas. Lucas has been very interested in pandas for quite some time, and wanted to have a Panda Picnic for his birthday party. Unfortunately the weather didn’t cooperate for the picnic, but he did have a panda party! Lucas chose to collect donations to help save the pandas instead of regular gifts. He collected $100! We followed up the party with a family trip to DC to see the pandas at the National Zoo. He was in heaven! Thank you Lucas for helping! My name is Vanessa and Pandas are my favorite animal. I love how cute they are and that they are mainly vegetarians who eat bamboo. 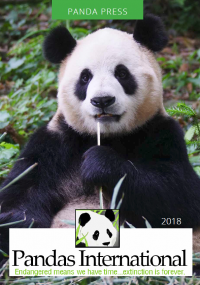 When I heard that Pandas were endangered I began planning a bake sale. My sisters both helped a little and we ended up raising $200. Thank you Vanessa for your dedication and support for the Giant Pandas. Here at QSI Atryau International School we have the Common Core Curriculum. One of our Kindergarten units is doing a How to Project. The class decided they wanted to do How To Make Lemonade. They wanted to have a lemonade sale and give the money to Pandas International. They have learned to be International Children. They care about the world. They speak up about recycling. We found a recipe for fresh squeezed lemonade, that is healthy. They wrote the recipe and made a how to book. They then practiced two times to make and taste the lemonade themselves. On lemonade week Monday - Thursday they made lemonade for thirty minutes and refrigerated it. They made lemonade signs and wrote invitations to each class to come buy lemonade. This was part of Literacy Week, we sold the lemonade along with a Book Swap and cupcake sale organized by the parent group here at QSI. The class sold 130 cups of lemonade at 1.00 tenge a piece. They learned so much through the experience and gave the money to a wonderful cause. Thank you QSI Atryau International School for your help to save the Giant Pandas. "I honestly do not know when I first got into pandas, but it was probably before I entered first grade. I like that they are cute, yet fierce animals. I saw my first live panda in Hong Kong when I was 6 and I have seen a panda at the San Diego Zoo. I've read all the books about Pandas" - Grace Grace used her passion for Pandas and collected change in her Panda coin bank over several years. She was able to raise almost $60 to help the Giant Pandas. Thank you! Our 8 year old daughter, Sarah, is an avid panda fan. The current number of pandas in her bed exceeds 30. One day she decided she wanted to do a fund-raiser to support her furry friends…but she didn’t know how to raise money for them. Through her research (i.e., dad’s research), Sarah came to learn more about Pandas International (PI). She adored the photos of the animals she loves so much and felt that PI would be the best way to help her friends. In early September 2017, she started planning for a bake sale. She met with the general manager of a local grocery store (Giant Food) to ask permission to hold the sale outside his busy store. Her mother, Kim, and grandmother, Sally, baked for several weeks to amass a sizable cache of homemade tasty treats which included chocolate chip cookies, muffins (pumpkin, blueberry and banana), triple chocolate brownies and Amish friendship bread. Some of these items were bundled into gift baskets. Her father, Chris, made good use of the print material and logos (on the PI website) to create posters, product stickers and bookmarks. He also printed copies of a PI newsletter for those donors who might be interested. Her brother, William, worked hard to set up for the event. The big day came (September 30th) and we saw a fair amount of traffic. Sarah enjoyed sharing the love she has for pandas with those who came by the bake sale. In the end, she raised $220! Needless to say, we were quite proud of her the hard work she put into this effort. Thank you Sarah for your amazing dedication in helping to save the Giant Pandas! Sophie has been working and saving her own money to adopt a panda through Pandas International since she was in second grade—now she’s in 5th. She has played her violin in Birmingham (Alabama), Tuscaloosa, New Orleans, and Ireland to earn donations, also along the way donating hundreds of dollars to the Ireland Seal Rescue and to several rain forest trusts. When she set such a high goal for Pandas International, I have to admit I had no idea whether she could do it. Well, yes she can! We’re so proud of her 🙂 Sophie raised $1,000 and has adopted Bing Bing. Thank you Sophie for your amazing dedication and generosity! You are making a difference in helping us to save the Giant Panda.